For great baby shower favors, the choice is clear. 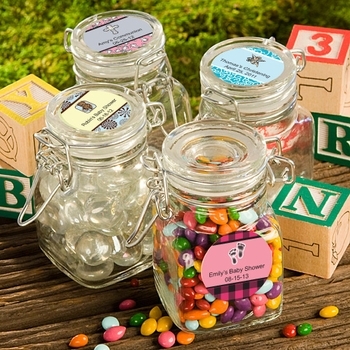 These customized glass jar favors are fun to give away and will make any special occasion even better! Each jar is 1 3/4 by 3 inches with a hinged lid, a gasket and metal locking clasp. You can apply your customized label to the front of the jar or to the lid, it's up to you! Our labels come in many color combinations, have a variety of themes and titles to chose from and are self-sticking for easy application. Note - Assembly required: You apply stickers to each jar. Jars come bulk packaged in individual poly bags and are delivered empty, ready for you to fill them with candy, treats or any items you wish.